Are you planning an Autumn makeover? 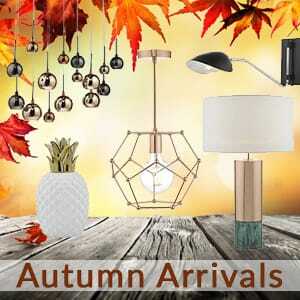 If you are then there’s great news, there’s a huge range of new lighting for you to choose from. If not then after seeing what’s on offer you may just decide to join in and get your home cosily lit for the approach of Winter! Whether you have a modern or traditional property our new lines will delight either setting so you’re sure to find something suitable. Let’s take a look at a few of the latest ceiling lights, we’ll start at those well suited to those of you with high ceilings, however it’s worth noting most of the lights suitable for high ceilings can always be shortened at installation for use in rooms with lower ceilings. 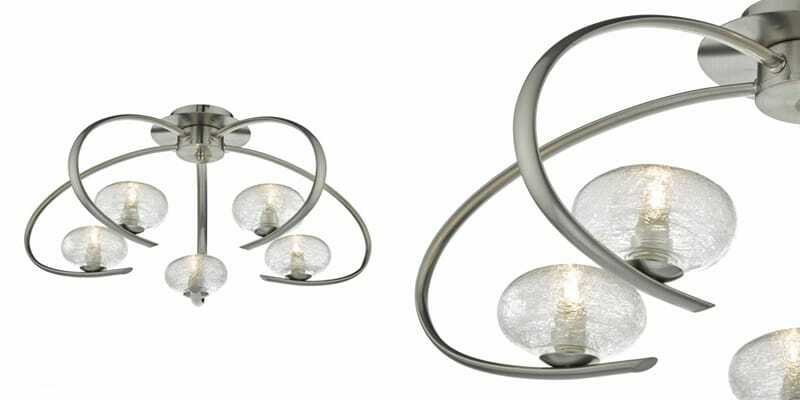 The Athena ceiling pendant shown above is a contemporary design 12 light ceiling light in a polished chrome finish with adjustable rotating arms. The light is suspended on a rod suspension and comes with 3 different sizes for situating at various heights during installation. This would be great for living rooms, dining rooms or long drop stairwells. The Trombone ceiling pendant cluster above is a 10 light multi pendant cluster in a brushed copper finish, the light is LED lit making it very energy efficient using only 30 watts in total but providing around 2605 lumens or the equivalent of about 250 standard watts. 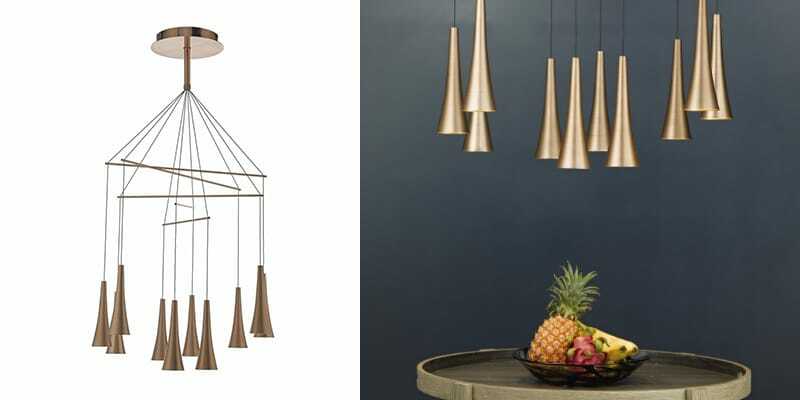 This would be a great choice for lighting over a dining room table or kitchen island, it’s sure to draw the eye as a unique feature piece of lighting. If drawing the eye is something you want to achieve then the Achates 9 light ceiling pendant shown above is definitely one to consider. As predicted in our TrendBoard last year we told you that minerals will feature prominently in interior trends, and here we are! 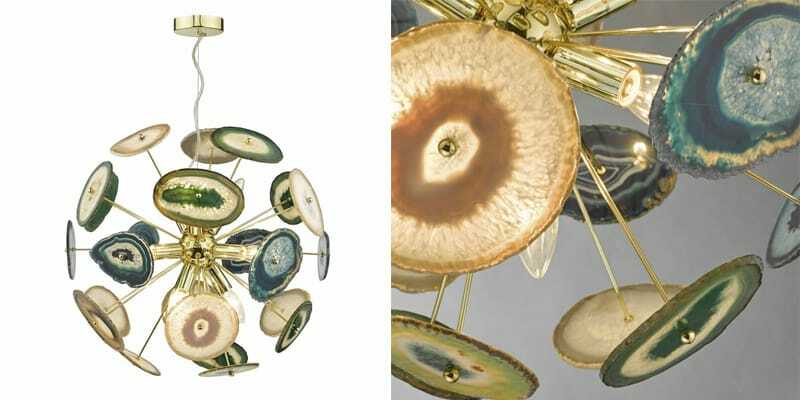 Creating a globe like shape made up from thin slices of agate rock on a polished gold arm structure this light is great for showing natural materials in an array of texture and colour. This would be great for feature lighting over a dining room table or in a long drop stairwell. Some of you may find yourself with minimal ceiling height, this isn’t unusual in living rooms and bedrooms so often you’ll see flush fit and semi flush fit ceiling lights being chosen for these rooms. Looking to add a bit of sparkle? 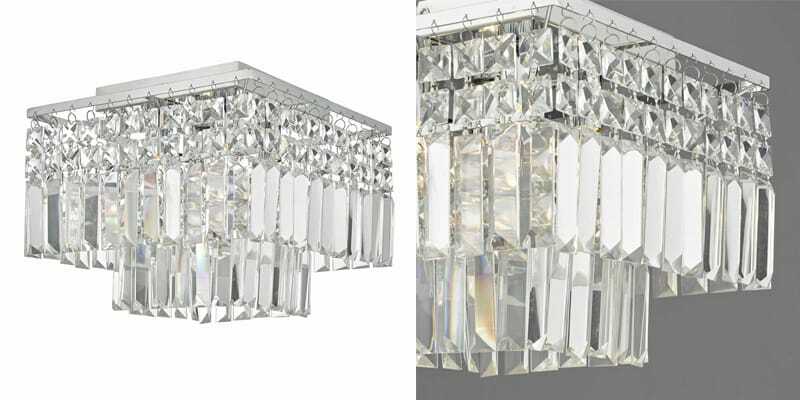 The Poseidon chrome and crystal ceiling light is a great choice with it’s polished chrome metalwork and adorning crystal glass droplets. The droplets will reflect the light beautifully for a glistening light effect that’s sure to add elegance and class to any room. If your room features more traditional design and you don’t think it requires sparkle then the Andre ceiling light is a great option. 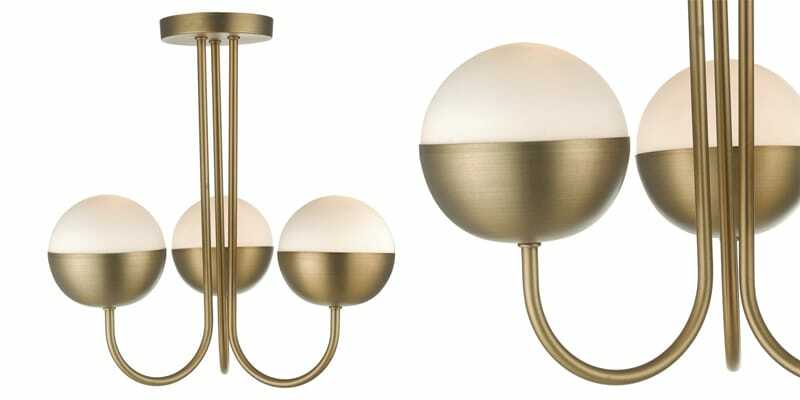 Using a brushed aged brass finish the fitting will have little trouble blending in with a traditional setting, the light also uses opal glass diffusers to create a soft spread of light that’s perfect for living spaces. The Leighton 5 light semi flush ceiling light in satin chrome has an unusual design that would be well suited to a contemporary room. 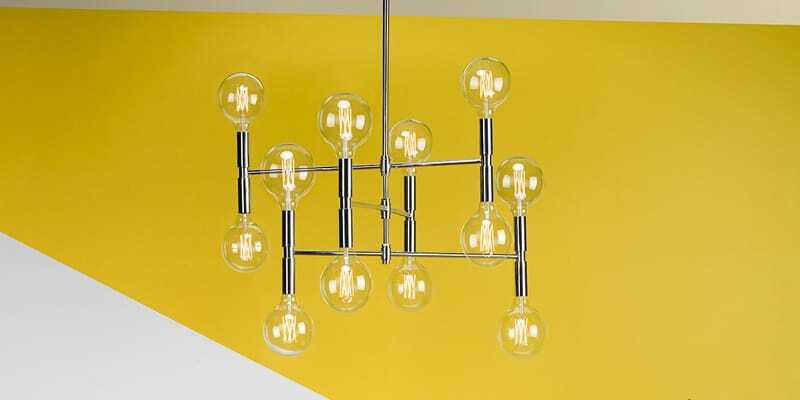 Complete with sugar cane glass shades which add a sparkle effect it makes a nice change to the standard 3 and 5 arm fittings. To see the full range of new ceiling lights click here: Ceiling Lights. Whichever you opt for there are accompanying wall lights to numerous fittings, even if they’re not in the same range we’re sure you’ll find something of a similar ilk to match in. The Felipe wall light (shown above left) has a modern vintage vibe and has a matte black frame with a clear ribbed tubular glass shade. 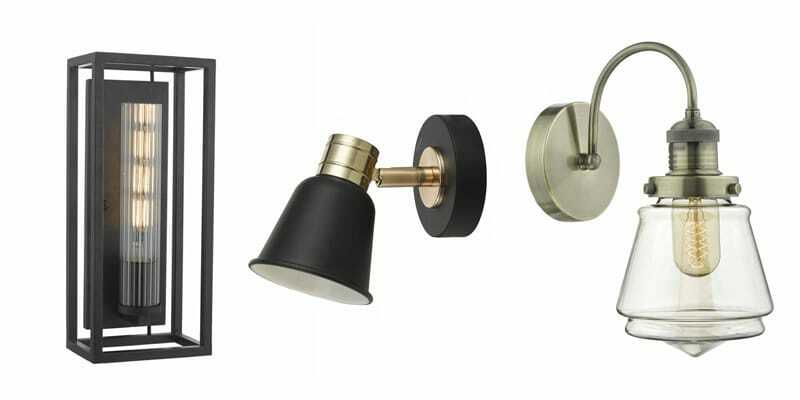 The Fry wall light (shown above middle) has a contemporary retro look and comes in a matte black and rose gold finish. The Curtis wall light (shown above right) comes in an antique brass finish complete with champagne tapered glass shade. All of these wall lights would be great for lighting in vintage settings and would look great in a kitchen, dining room or hallway. To see the full collection of new wall lights click here: Wall Light. 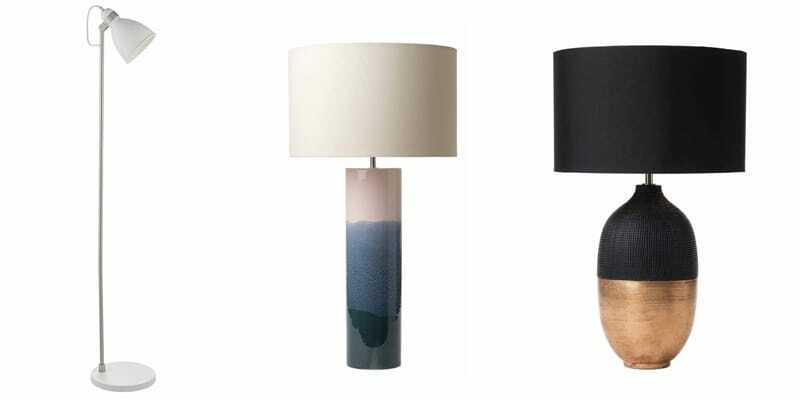 As well as the large range of new ceiling and wall lights we’ve also seen an introduction of new table and floor lamps. The lamp shown below left is the Frederick floor lamp in a white and satin chrome finish, the retro design would be great for reading and task lighting in a modern or mid century setting. The table lamp shown below middle is a ceramic lamp called Ignatio, handmade in Portugal with an applied glaze of pink and blue for a gradient effect this would be great for any lounge or bedroom. The lamp below right is the Siya ceramic two tone textured table lamp in copper and black, similarly to the Ignatio this lamp is handmade in Portugal and undergoes transformations during firing to create a unique work of art every time. To see the full range of new table and floor lamps click here: Table and Floor.